Laser cut screening wall art is becoming a popular option for homeowners around Victoria. It offers an incredible aesthetic and infinite customisation, while also being low-maintenance and cost-effective – quite a combination isn’t it? You can see some of our handy work at this Point Cook property. We all know how useful metal is in construction, but could it be the design option your garden has been looking for? 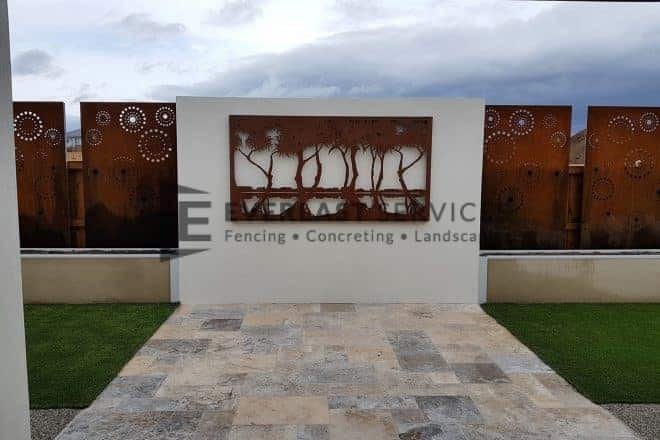 With laser cutting technology, large sheets of metal can be turned into garden screens and art that go far beyond what you would typically see in a backyard. Accessibility: Improvements in laser technology have made this form of art accessible. You get a high-end designer piece without the price tag. Customisation: You get to control the design. You don’t just have to pick from a range of pre-selected designs, it’s entirely up to you. You want your initials on a screen? Go for it. Versatility: Your screen can be much more than a standalone piece of art. It can become a green wall or vertical garden, used as a backdrop for a water feature or even used to decorate and fence in pool surrounds. Low-Maintenance: Screen walls are basically maintenance free. Metal has become a popular construction material because it is basically unbreakable and doesn’t deteriorate. Just hose it down to remove any debris and enjoy the changes your screen goes through as it ages and weathers. Durability: No matter where you position your laser cut screening wall art, you can expect to have it for life. What purpose will it serve? Obviously, a piece of art for a pool surrounds will be different than something you plan on draping with creepers. Determine the purpose to determine the design. What does your property look like? Your metal screen can look traditional or modern. The direction you choose largely depends on the rest of your design. You want your art to suit the overall flow of the landscape, so make sure the design fits your overall vision. Privacy? Do you want your screen to shield you from your neighbours? If you do, you need to focus on a more minimalistic design with smaller holes. Of course, if you want privacy and a maximalist design, why not back your screen art with another piece of metal and enjoy the best of both worlds. Material? Modern lasers can make short work of most materials. So, it’s a question of cost. Steel is cheapest and most durable, but will rust quickly unless you coat it with a protective coating. 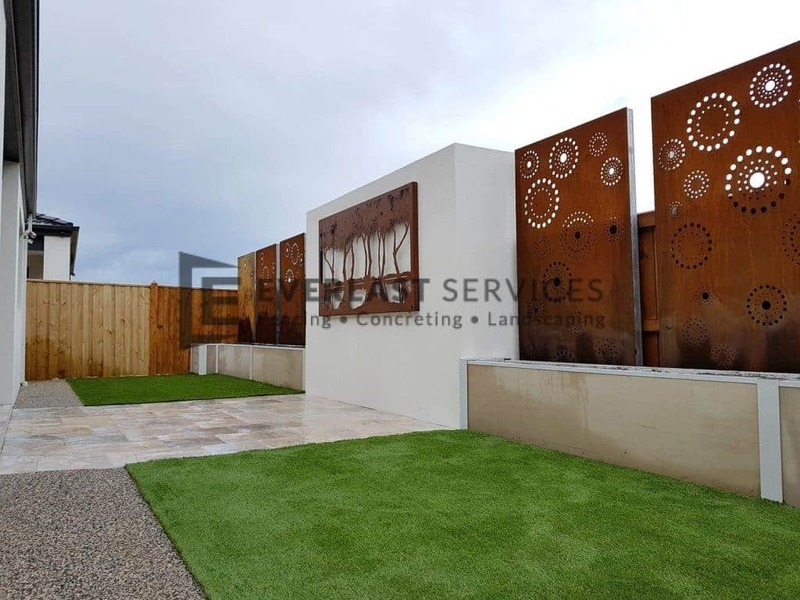 Weathering steel is a great option, it is naturally-rusted and more expensive but perfect for gardens. Stainless steel is another slightly more expensive option that is rust free, while aluminium is the most costly while being easy to handle and therefore an excellent option for intricate design pieces. Of course, you don’t have to install them yourself if you get them designed with us. We look after everything for you. We listen to your design vision and put it into practice. 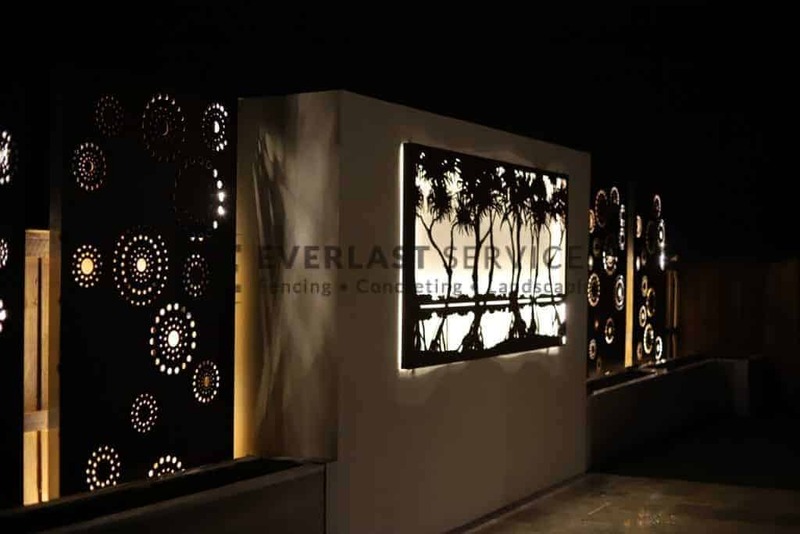 Our talented fabricators then begin the process of crafting your artwork, before our installation team visit your property and install it exactly where you want it. Not happy? We’ll pick it up and start again. If you want to add something different to your garden, you need to consider laser cut screening art. It offers everything the modern home needs and gives you complete control over the design process.